You’re interested in East Sea nowadays, international relationship in East Sea, how ‘s sovereignty and jurisdiction’s East Sea belong to countries? How’s the status quo of East Sea nowadays? 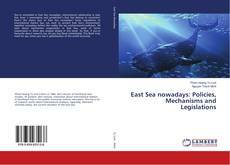 Some regulations of international marine law, we must to protect East Sea’s environment together nowadays before the reality the sea environmental pollution. All issue about mechanism cooperation in East Sea, some of forms cooperation in there also analyze deeply in this book. So that, if you’re favourite about research sea, let you buy Book immediately. This Book truly need for you when you live in globalization of the world economy.